I posted this entry back on the 8th but considering that I finished two books today, I decided to revise the list rather than post a new one xD So the remaining books on my list are quite a mixed bag, though there’s quite a bit of fantasy in there (I’ve decided to stop buying fantasy for a while considering how many books are left there); plus, I’ve been quite good—I went to the bookstore a few days ago but I didn’t pick up any new novels save for the Anna Gavalda’s Ensemble C’est Tout (I read the English translation, Hunting and Gathering, but I wanted to read it in the original French). Aside from tackling the remainder books on this list, I’m also drawing up a list of books to re-read, particularly from my history shelf in preparation for the fall semester; I’m not entirely sure what my duties as TA are yet but it’s best to be prepared 🙂 I’ve firmly decided to take Adams’s The Hitchhiker’s Guide to the Galaxy: A Trilogy of Four with me in the fall, although it’s rather large and I’m taking a couple of textbooks as well. My teaser for this week: “‘My men say there are no eggs in Leningrad, but I believe there is everything in Leningrad, even now, and I just need the right fellows to find it. A pair of thieves. 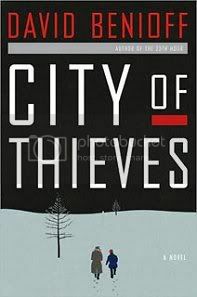 '” – p. 35, City of Thieves by David Benioff.